Whether you’re looking for a little Hollywood-grade gore or a heart-pumping thriller, California’s escape rooms are among the best in the country. These increasingly-popular games put your problem solving and teamwork skills to the ultimate test. Here are the 10 best in the state! Los Angeles has a variety of escape rooms but Room Escape Los Angeles by Fox in a Box has been voted by Forbes as the best. Part of the reason is the variety of rooms that Room Escape offers. Choose a themed room based on your experience level or personal interests and be prepared for an immersive experience. Escape Room Palm Springs is the perfect place for a group activity. Whether with family, friends or looking for a way to build your team, Escape Room Palm Springs is there for you. You’ll also find rooms that are suitable for those with disabilities so that nobody is left out of the fun. California Sate Escape offers a variety of escape experiences that challenge you to beat the clock in order to get out. You can book online to make sure that your group remains your own private group and just show up a bit early for a safety briefing, including emergency situations. The Clockwise Escape Room differs from other escape rooms because they provide an overall game experience for all kinds of groups. You can create games with all sorts of different efforts whether you enjoy trivia or treasure hunts. Steal and Escape is designed especially for small groups of 3-6 players, although groups of two are allowed. Unlike other escape rooms, Steal and Escape is designed to focus on trivia more than thrills and can be great for families that have older kids. Quicksand Escape Games take you to a specific time and place to solve your escape room. Not scary, Quicksand is designed to give you a fun time, not the thrill of your life. Many families with members of all ages love the ability to solve puzzles together and the ability to do something outside the ordinary. Mission Escape Games is perfect if you’re looking for a thrill or a scare. The escape room offers both scary horror experiences as well as complex mysteries. Choose your preference and be prepared for an escape room that you won’t soon forget. Mission Escape Games offer both public and private experiences, depending on your preference. 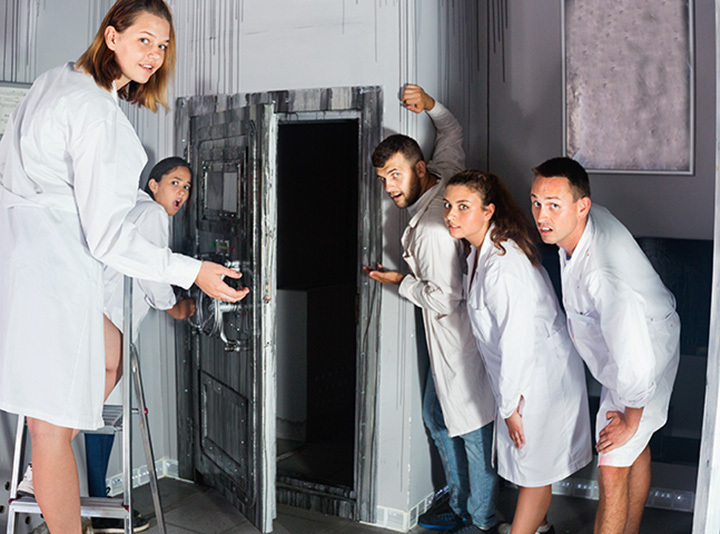 Whether you want a creative date night, a corporate event or a special birthday party, Beat the Lock Escape Rooms has escape rooms for all ages and events. You can book a kids party or have a unique way of getting to know your date. The mystery experiences put you in charge. Amazing Escape Room in Northridge is the west coast branch of the international escape room trend. Offering creative rooms and special experiences that offer various challenges to help you work together as a team. If you get stumped, you can always get a hint from an expert as you work through your challenge. Proud to known as a leading escape room in America, The Basement is mainly suitable for players over age 18—so be sure to be careful if you’re playing with younger players. Choose your experience from a creepy, scary backstory and then be prepared to think your way out within a set time limit.